Last week, Joel Hodgson launched a Kickstarter campaign to revive Mystery Science Theater 3000 with a characteristically sarcastic video in which he is heckled by Tom Servo and Crow T. Robot over his appeal for money to make a show famous for its low budget. Crowdfunding compliments a cult program like this, but it’s becoming a reality for all kinds of television. As the way we watch TV changes, so does the way that it’s financed. In fact, I’m currently involved as an actor in a TV project that needs a crowdfunding campaign before it can get off the ground. It’s a mystery…why they need money! I’m talking about The Cast Members, a sitcom in the great American tradition of the comic ensemble about the employees of a cinema/theatre (delete depending on whether you’re saying it rightly or wrongly), created by Aaron David Roberts. Even though the concept is so good you can’t believe it hasn’t been done before, the scripts are as tight as those trousers David Bowie wore in Labyrinth, and it features some of the best onscreen and stage talent in San Diego – and in L.A., for that matter – without the backing of a production company or network (in whatever broadcast or digital form they exist now), it’s the audience that has to pay upfront to make the program they want to see. A crowdfunding campaign will start next year and my work for the project so far has been to shoot a promotional video that takes the form of a condensed pilot. Crowdfunding is common enough when it comes to reviving a show that’s been cancelled by a network, as the Kickstarter campaign that brought Veronica Mars back to our screens as a feature film illustrates. 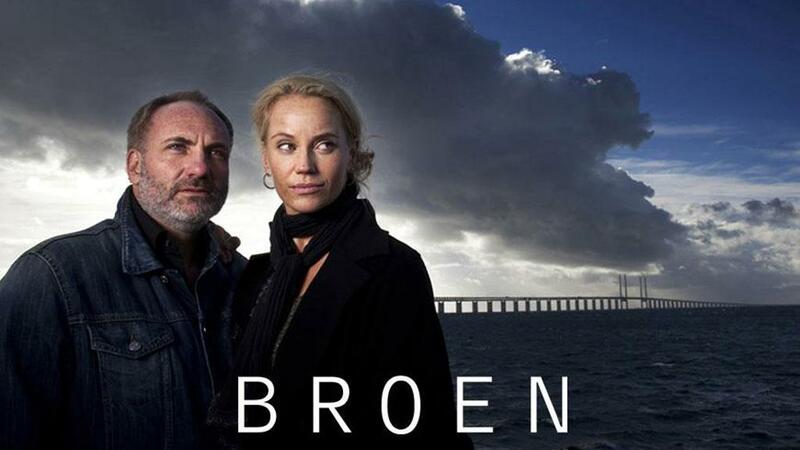 It’s a relatively new concept for launching TV shows, however. Nat Geo’s global pub crawl Chug is considered the first Kickstarter-funded series and that starting airing in 2014. In most crowdfunding campaigns, success is determined as much by the incentives for donating as the product. These ‘perks’ – as they are known – range from bonus material (a callback to the DVD extra and Easter Eggs that made us pay twice to watch TV the first time round) to branded merchandise only available to donors, and usually only by donating a specific amount. It’s easy to see how this form of financing would work in the current TV climate, which is driven largely by multi-platform intertextuality and consumption. Many of the series funded by Kickstarter campaigns are intended to stream on the web rather than ever make it to air, although the distinction between the two is closing as some of the most highly-regarded TV of our time now begins online and stays there. Chug eventually found a major cable network, despite the fact that it was their collective ambivalence that compelled producers to go the crowdfunding route in the first place, and can’t be seen as representative. The Veronica Mars feature film was streamed on Amazon Instant Video but I doubt whether the decision to add the film to their stores posed much of a quandary for the online shopping giant given that it was a known quantity and that production had already been paid for. I’m sure it’s not normal to exceed funding goals in the way the campaigns for Veronica Mars and Chug did either. There’s usually some kind of trailer for the project requiring funding to launch the campaign. The Kickstarter for Veronica Mars assembled actors from the series and had them perform their launch video in the style of the teen noir. 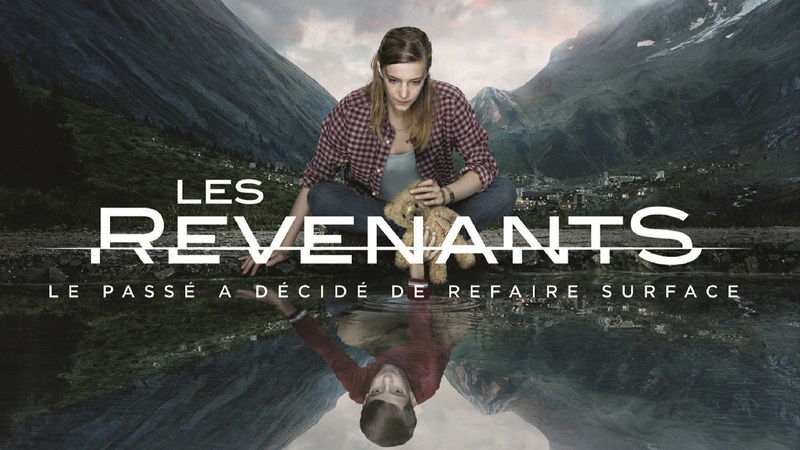 You might also say that the three seasons of the show were the trailers for the feature remake. For The Cast Members, Aaron decided on a mini-episode, which made the most sense since the actors had already been cast and storylines devised for the first season. It also meant that the Kickstarter could act as a shop window for the series and its stellar cast, as well as a fiscal means to an end. Mounting a pre-pilot also suggests that the ‘starter’ bit of the campaign website’s name is misleading, as projects need to be in an advanced stage, both conceptually and in finances, to even launch a campaign at all. By all accounts, the Kickstarter to revive Mystery Science Theater 3000 is doing well, as did the one for Veronica Mars, while Chug demonstrated that it’s possible to get a brand new show on the air using crowdfunding. It’s still a high-risk, high-reward strategy that may bankrupt you before launch. Tarantino has always been a lone voice in the debate, distinguished by an unerring respect for television as an artistic medium and his belief that there is still a tangible distinction between TV and cinema. There are few commentators on either side that can keep hold of both these ideas. Some of Tarantino’s finest work as a director was in television – in ER and CSI, no less – and it’s clear from his movies that TV falls under his muse. But he’s a filmdamentalist and his staunch refusal to acquiesce to the digital industry standard is also an outright denial that TV and cinema have conflated. Tarantino’s vivid descriptions of two experientially different media are more compelling than most critics’ vague sense that TV is becoming more like cinema. The auteur reserves his derision for the cultural no man’s land of mall-adjunct multiplexes where, as Jackie Brown’s Max Cherry once observed, you see ‘something that starts soon and looks good’. It’s here that film is simply an afterthought of conspicuous consumption, not a thing of grand beauty and spectacle or part of a boutique outlet delivering sophisticated cable programming. There’s an all-or-nothing-at-all fatalism about Tarantino’s views on cinema, a regression to the mid-century belief in a divergence between TV and movies based solely on the size of the screen. It’s a welcome counterpoint to the ubiquity of convergence rhetoric, but perhaps in the end just as misguided and myth-driven as its opposing view. Another coincidence is that Tarantino’s remarks were reported in the same week that FX began airing the new season of Fargo, a series that asks questions about the relationship between TV and cinema. 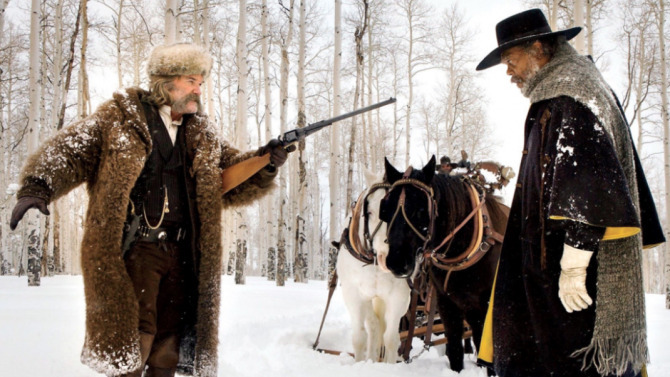 The series is a spin-off from the 1996 movie directed by Tarantino’s indie contemporaries The Coen Brothers, but once again this season is elusive about its status in regards to the cinematic source material. Actors in the series are frequently costumed and posed to look like characters from the movie, even though they’re playing completely new roles. This season is set during the Carter administration and has the crumpled golden look of late seventies movies, yet the split screen techniques speak more to TV title sequences of the era, not to mention a much more recent breakthrough in televisual narration, Fox’s own 24. The previous season of Fargo – an anthology of season-long stories, which doesn’t make eliciting its cinematic and televisual qualities any easier – seemed at first a remake of the movie’s storyline with similarly Manichean characters and labyrinthine plotting yet by its end, it felt more like a sequel, having been found in and extrapolated from the timeline of the original. 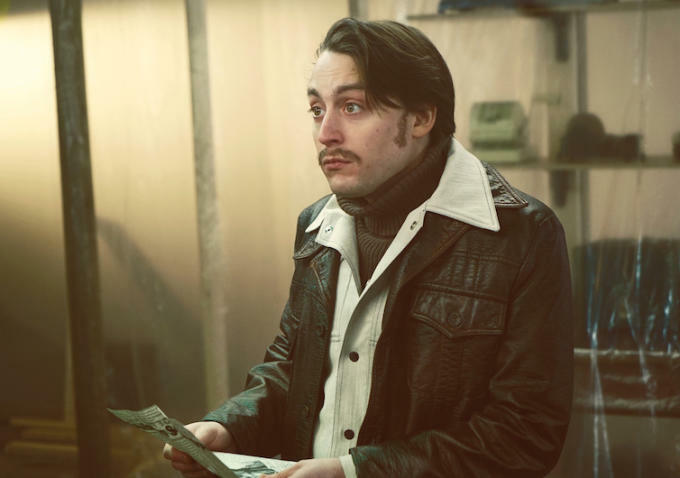 With Kieran Culkin’s uncanny resemblance to a young Steve Buscemi and in the very first episode a visual homage to the late Harve Presnell, whose implacable moustache loomed large over the movie, I suspect we might have just as ambiguous a play with the cinematic mythology this time around. The stars don’t help. Ted Danson has long been identified with television. Meanwhile there’s a Culkin in the cast and plenty of actors who are split exactly evenly across the two media. It’s almost as if Fargo wants to create a new hybrid creature that is neither and both. Fargo’s messy intertwining of TV and film consciousnesses works at cross-purposes to what Quentin Tarantino is saying about the continued separation of the two. When we watch Fargo, we’re unsure about how much of what we’re watching belongs to which media. As Tarantino suggests, seeing a movie at a multiplex as a food court folly could lead to the same confusion, while watching it projected wide on film stock would absolutely not. The couch brings together movies and TV, often in the same flowing package, but does it always clarify which is which? Over the summer, two of the most important seats in late-night television were vacated. Unlike last year, when NBC’s The Tonight Show promoted Late Night host Jimmy Fallon and CBS’ The Late Late Show traded like for like – to maintain the quota of British late-night hosts at exactly one – each of the replacements was not the heir apparent. Host of CBS’ Late Show David Letterman was succeeded by Stephen Colbert, who came in from Comedy Central, having been host of The Colbert Report and contributor to The Daily Show, and not long-time Late Late Show host Craig Ferguson, Letterman’s protégé who had, like his mentor, smashed the orthodoxy of the genre. At least Colbert was recognized as a great innovator and radical presence on TV – as well as a nifty enough entertainer – when he was awarded the Late Show crown. Utterly unlike newcomer Trevor Noah, who was bumped several pay grades when he went from Daily Show contributor to taking Jon Stewart’s job as host. In fact, Colbert was the more likely of the two to take over The Daily Show. Former contributor and frequent guest host John Oliver was a shoo-in to take over until HBO made him an offer he couldn’t refuse. After that, the choice was anyone’s guess. But Noah was no-one’s. Noah and Colbert have wildly different briefs. To emulate Letterman, Colbert is obliged to be as challenging and groundbreaking as possible while Noah is the steward of a culturally necessary ritual, and cannot dismantle its beloved format. As such, Noah might seem to have the harder job. But Colbert’s fluent presentation masks his deft deconstruction of late-night talk formula. He has replaced the monologue with political analyses. Guests tend to be public figures with cultural significance rather than celebrities hawking their wares. It’s a forum for news and current affairs and a showcase for high culture. Fallon’s breakthroughs by contrast have been primarily vaudevillian and even Ferguson’s reinvention of the genre as burlesque slapstick went in the opposite direction to Colbert. It’s not just the fluency with which these changes have been implemented, but also how assured, joyous and endearing Colbert is while doing it. 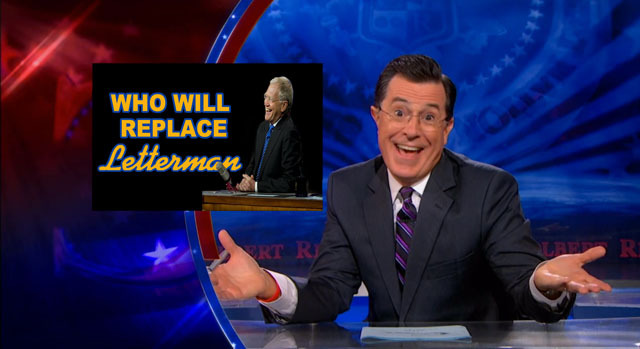 This he may have learnt from Fallon’s head-start, but Colbert pursues it the name of something far more significant. The sad irony is that Colbert is exactly the personality The Daily Show needed to preserve its legacy, while Noah is not. Two weeks in to Noah’s reign and the added value of Jon Stewart’s easy-going charm has finally been calculated in full. A solid comic mind is simply not enough. Stewart covered a multitude of sins with his asides and interludes of self-mocking, and without them we can see just how little content there is in the average Daily Show news item. Noah has exposed this, but I don’t level the blame at him. It takes a particularly kind of host – a Letterman or Carson, for example – to engage the audience without losing them when holes appear in the format. Noah has his long, pregnant smile, but to the live studio audience and the viewers at home, it reads as a stumble or a stall, even in the strongest segments like his brilliant mash-up of the Trump mythos with that of African dictatorship. Moments like this reassure us that the quality of mock-journalism has not dropped off, but in this case a pair of safe hands will not suffice. We need someone who can convince us they’ve revolutionized The Daily Show when nothing has changed, not a competent caretaker. Conversely, Colbert’s Late Show coup seemed bloodless, yet was a conceptual genocide. Fallon has proved it’s possible to succeed in late-night television by being a vessel for the greatness of others, and indeed Stewart leaned on Oliver and Colbert in exactly that way when they were Daily Show contributors, so Noah cannot be written off yet. Oh no, they forgot to change the titles! 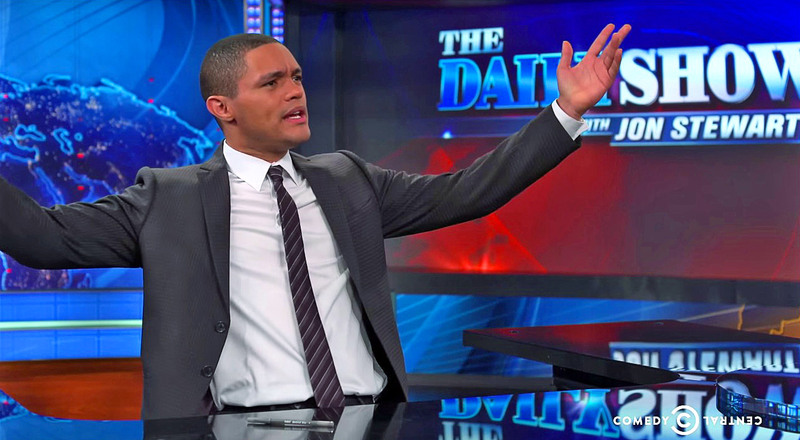 The Daily Show and Late Show are probably the two late-night talk formats that matter most culturally – with the possible exception of Neil deGrasse Tyson’s StarTalk. The former is so because it is the closest America has to a reliable news source; the latter because Letterman made it a hotbed of comic artistry in the 90s. But because American TV is an inherently commercial animal, they require a certain kind of salesmanship to help audiences buy into them. Colbert’s hate-resistant persona is the perfect medium while Noah’s workmanlike anonymity may not be, at least not in the long-term. But can Colbert sustain these unimaginable highs?